Pyxis provides services that drive results. From the top of the funnel with SEO and paid acquisition, through lead nurturing and sales enablement, we work to ensure that every service we provide aligns with your goals. Combined with our recommended solutions, we can chart a path for your company towards increased revenue. We work with companies that are serious about growth and process. They know that without process, growth is chaotic, and that without growth, process is pointless. There’s a sweet spot in the middle that we cater to. If you think that the best marketers understand sales and the best salespeople appreciate marketing, we want to talk to you. We start by providing a full-funnel analysis for any prospects to understand what’s working well in their current marketing and sales processes, and what can be improved across the revenue operation. After we’ve presented our findings, we’ll provide some initial recommendations on where to start. We have deep experience in modern growth services. 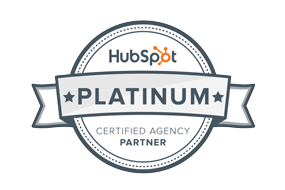 We’ve been a HubSpot partner since 2012 and know the ins and outs of generating leads, nurturing them and closing them. Over the years, we’ve built additional expertise in services and solutions that amplify those efforts and make for a more comprehensive sales and marketing strategy.